(Nanowerk News) Rice University scientists have discovered an environmentally friendly carbon-capture method that could be equally adept at drawing carbon dioxide emissions from industrial flue gases and natural gas wells. The Rice lab of chemist Andrew Barron revealed in a proof-of-concept study that amine-rich compounds are highly effective at capturing the greenhouse gas when combined with carbon-60 molecules. The research is the subject of an open-access paper today in Nature’s online journal Scientific Reports ("Cross-Linking Amine-Rich Compounds into High Performing Selective CO2 Absorbents"). Tests from one to 50 atmospheric pressures showed the Rice compound captured a fifth of its weight in carbon dioxide but no measurable amount of methane, Barron said, and the material did not degrade over many absorption/desorption cycles. 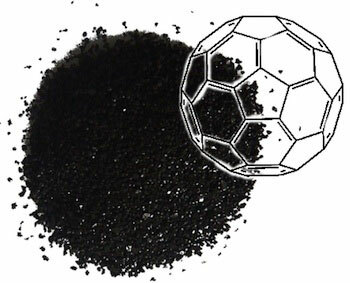 Carbon-60, the soccer ball-shaped molecule also known as buckminsterfullerene (or the “buckyball”) was discovered at Rice by Nobel Prize laureates Richard Smalley, Robert Curl and Harold Kroto in 1985. The ultimate curvature of buckyballs may make them the best possible way to bind amine molecules that capture carbon dioxide but allow desirable methane to pass through. The Rice lab used buckyballs as crosslinkers between amines, nitrogen-based molecules drawn from polyethyleneimine. 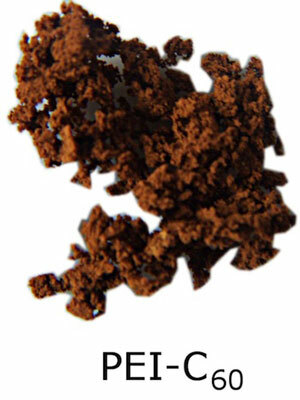 The lab produced a brown, spongy material in which hydrophobic (water-avoiding) buckyballs forced the hydrophilic (water-seeking) amines to the outside, where passing carbon dioxide could bind to the exposed nitrogen. He said the Rice compound compared favorably with other carbon-capture candidates based on metal organic frameworks (MOFs). “It’s about equivalent to the best MOFs for carbon capture, but our material is far more selective. Methane just doesn’t absorb,” Barron said. Unlike MOFs, he noted the Rice compound absorbed wet carbon dioxide as well as dry. Barron said it’s just as important that the compound release carbon dioxide efficiently for reuse. “We noticed a long time ago that if we attached amines to carbon nanotubes or graphene, they lowered the temperature at which carbon dioxide dissolves,” Barron said. Industrial amine-based scrubbers must be heated to 140 degrees Celsius to release captured carbon dioxide; lowering the temperature would save energy.